HI839800 is supplied with a power cable and instruction manual. The HI839800 COD Test Tube Heater features two predefined temperature profiles: 150ºC and 105ºC. Digestions for chemical oxygen (COD) and total phosphorus are conducted at 150ºC, while total nitrogen digestions are conducted at 105ºC. The test tube heater automatically heats up to the set temperature, holding it until the countdown timer has finished. Once the timer has ended, a beep will sound and the heating element will turn off. The outer casing of the HI839800 remains cool to the touch, even during a timed digestion. An optional lab safety shield and test tube cooling rack provide a complete setup for sample digestions. The test tube heater features two predefined temperature profiles at 150ºC (221ºF) and 105ºC (301ºF) that can be selected at the press of a button. The HI839800 alerts users in the event that the temperature of the heating block is either above or below the set temperature. A timer icon reminds users to wait until the heating block has cooled or warmed up before inserting their samples. 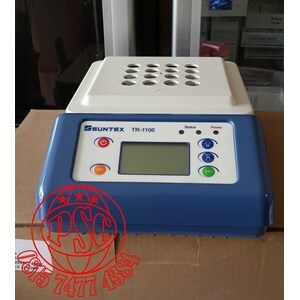 A built-in countdown timer of up to 180 minutes allows users to easily set the required digestion time by simply pressing the up and down arrows. Once a time has been set and the heating element is stable, a press of the START button begins the digestion procedure. Three LED lights are featured on the HI839800. A green LED indicates the heater has been turned on; a yellow LED indicates when the heater is actively heating up to a set temperature; a red LED indicates when the heater goes above 50ºC, reminding the user that the aluminum element is hot. The HI839800 contains a thermal fuse that prevents overheating. Should overheating occur, the heater automatically shuts down and all LED indicator lights turn off. In addition to the 25 vial capacity of the aluminum heating block, a small well is available for a temperature probe for users that wish to verify their heating block. The HI839800 features two operating modes: idle and heating. Idle mode is the default mode in which the heater measures and displays the current temperature, target temperature, set reaction time, and an “idle” tag. Heating mode is activated when users press the START button; it starts when actively heating and continues during the countdown timer. 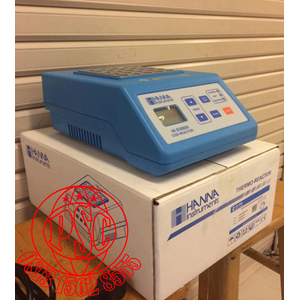 The block temperature is continuously displayed on the easy to read LCD display, even when there is no active temperature program running. All relevant information in addition to temperature are easily visible during idle and heating mode. Messages on display alerting to problems including high or low temperature, hot surface, or heating system malfunction. Reagents are available in liquid or powder form, and the amount of each reagent is precisely dosed to ensure maximum repeatability. ǂMethod with chromium-sulfuric acid is officially recognized by EPA for wastewater analysis. ◊The HI94754F-25 and HI94754G-25 method follows the official method ISO 15705. ◊◊This method is recommended for general purpose analysis with no chloride interference. 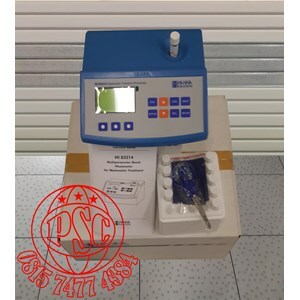 HI83214 is supplied with sample vials and caps ( 5 ), batteries, 12 VDC power supply, and instruction manual. Anda Mencari "Chemical Oxygen Demand ( Cod ) Meter"? Buat Permintaan Untuk "Chemical Oxygen Demand ( Cod ) Meter"